With more than 500 million users present on LinkedIn, of which, 61 million users are senior-level influencers, 40 million users are decision makers and around 7 million users are C-level executives, it is without a doubt a B2B marketer’s dream. Around 94% of B2B marketers out there are already making use of the platform to showcase their expertise, generate leads and make a tonne of sales. But are they doing it well? If you are experiencing sub-par results from your marketing efforts on LinkedIn or haven’t yet started your marketing journey on the platform then this post is just for you. I have mentioned some actionable steps below that you can take to put your LinkedIn marketing efforts in top gear in 2019. Knowing your audience inside-out is vital when it comes to making your marketing efforts work not just on LinkedIn but every other social media platform as well. Your spectacular content and impeccable visuals won’t excite your audience if they are targeted towards the wrong people who are not interested in the services you provide. Create buyer personas to get an idea of who your ideal customer is and create all of your content just for them in order to make an impact. Talking about creating content, once you gain a deep understanding of who your ideal customer is, it gets relatively easy to tailor your content to what your audience really wants to know and helps you showcase yourself as a business that really cares about their customers. According to LinkedIn, business pages filled with all the required information on the platform enjoy 30% more weekly views. So, don’t shy away from giving all the relevant information about your business in order to attract users, after all, doing so can help you represent your business in its entirety on the platform. Don’t take it lightly and add a catchy banner image, put a nice profile picture and pour all you can in the 'About Us' section of your business profile on LinkedIn including your website URL, location, industry, company size, number of employees and anything else you think is relevant. Also, don’t forget to add relevant keywords related to your business to your profile so as to attract users searching for businesses like yours on the LinkedIn and Google. 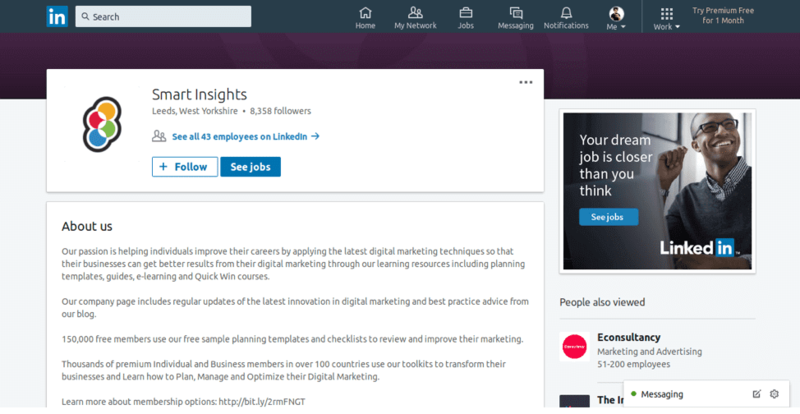 Apart from actively advertising (which we’ll soon get to) on the platform, publishing thought-provoking articles on LinkedIn is a great way to gain exposure, assert yourself as an authority in your industry and generate leads. Most of the decision makers on LinkedIn stroll through the platform to consume insightful content that will help them operate their business better and are more likely to engage with and buy from businesses that do the same. 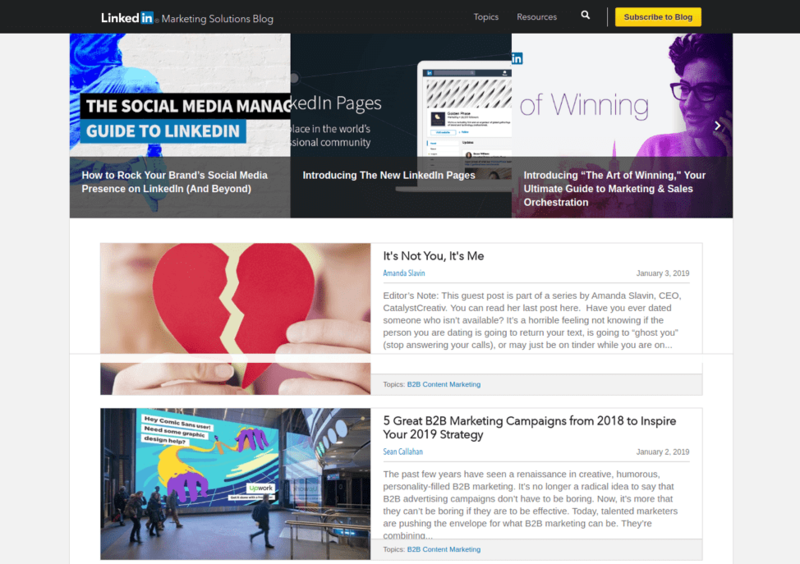 LinkedIn is a great publishing platform that lets users and businesses publish articles with ease and share with their connections and followers. Also, you can amplify the exposure your articles generate for your business by sharing them with relevant groups present on the platform related to your industry. Don’t forget to leverage them as well. While you can post blogs or other updates that redirect users to your main website or other important pages beyond LinkedIn, the LinkedIn algorithm greatly prefers native content that lets users consume content on their platform itself. This regularly updated guide, authored by B2B marketing specialist Danny Bermant will help you both if you are new to LinkedIn as a business, or are trying to make better use of it as an individual. After LinkedIn was acquired by Microsoft in 2016 for $26.2 billion, the platform has heavily focused on upgrading its advertising arsenal. Today, LinkedIn offers a plethora of advertising options with unmatched targeting, segmentation and analytical capabilities which the advertisers present on the platform can make use of to make all their campaigns an absolute success, and you can too. If you are serious about advertising on LinkedIn, then spending some extra cash for advertising on the platform can see positive results. Here are a few advertising formats the platform has to offer. 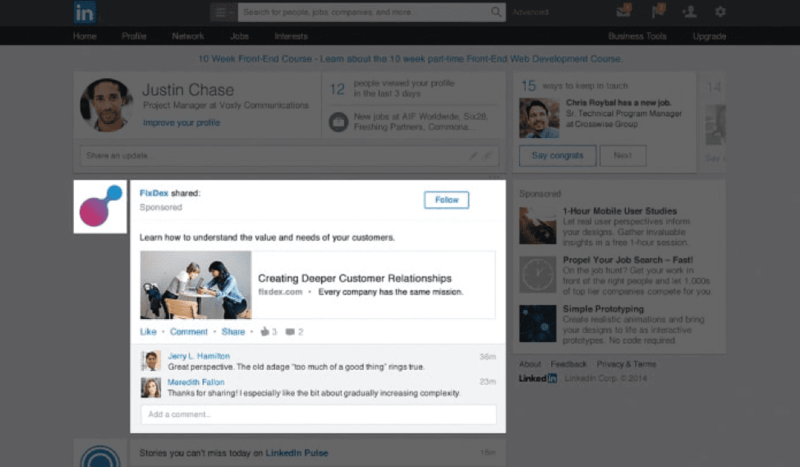 Sponsored content is the most basic form of advertising on LinkedIn. It is basically a normal post on LinkedIn that you boost with your advertising spend to a selective audience. 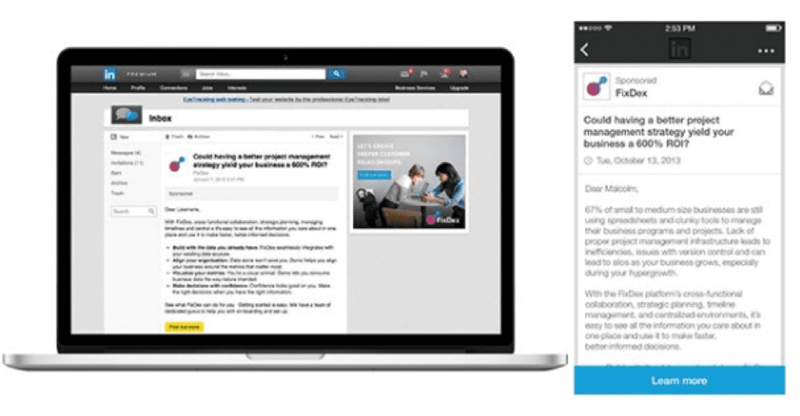 Great for reaching out to your audience directly, Sponsored InMail is a paid-for dedicated service provided by LinkedIn that lets you send private messages to users. Sponsored InMails are reported to provide 11 times better open rates than traditional email. 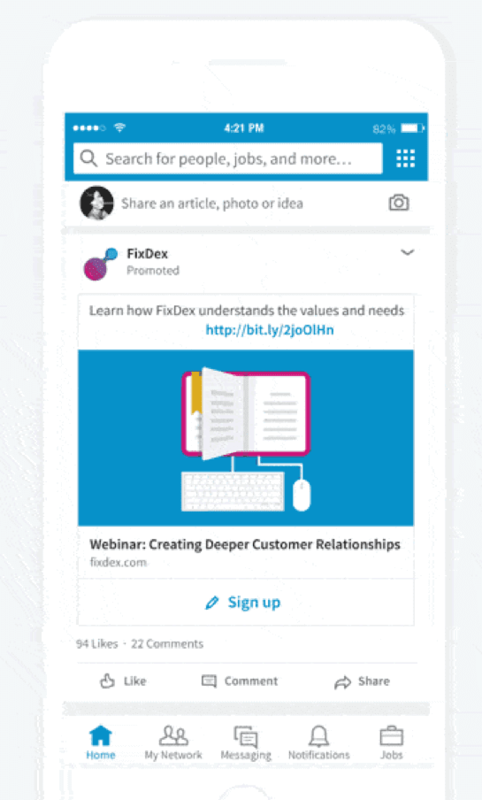 Text Ads on LinkedIn show up on the top and right side of user’s feeds and include brief ad copy with a small image. 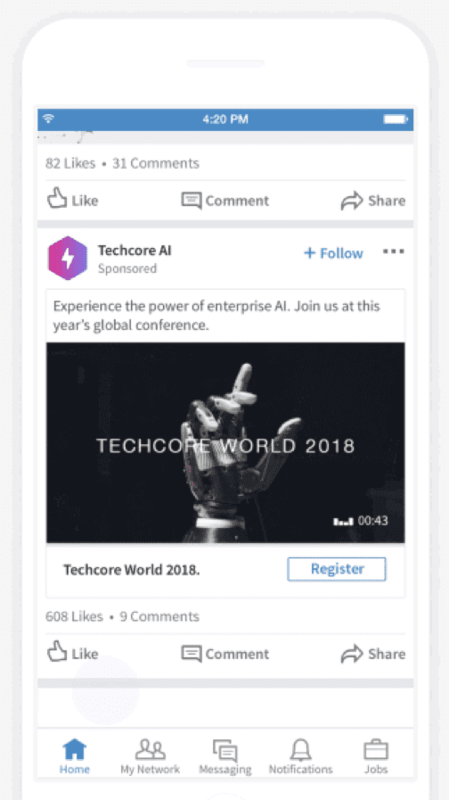 LinkedIn Dynamic Ads are the first of their kind to dynamically adjusts themselves according to the user the ad is being shown to. The ad changes its content and profile image depending on who is being targeted. 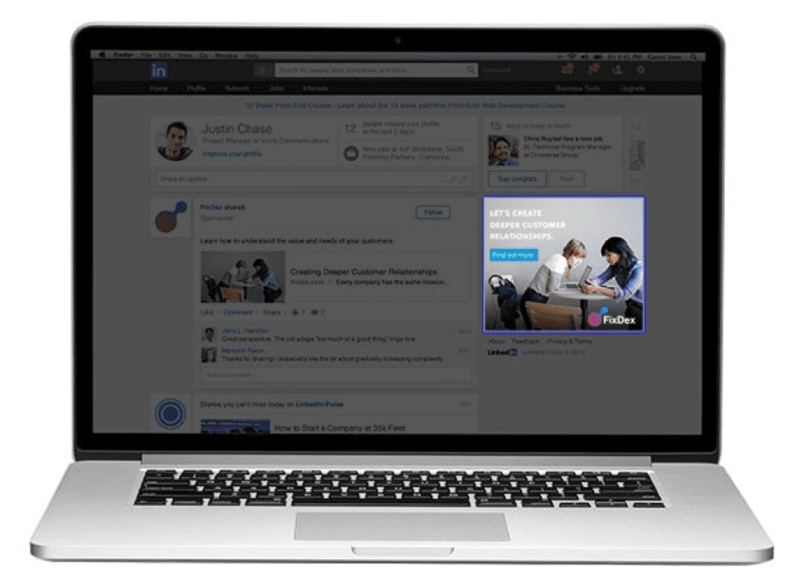 You can buy LinkedIn Programmatic Display Ads programmatically using your preferred DSP. You can use your own first or third party data or LinkedIn segmentation and targeting options to target LinkedIn Programmatic Display Ads to your preferred users. All of these advertisements can be deployed, tracked and optimized via the LinkedIn Campaign Manager (we’ll talk about that in a while). Depending on your business objectives, you can choose the type of LinkedIn advertisement you want to make use of to get the best results. Whether you want to generate awareness for your business or build quality leads, the LinkedIn advertisement guide will tell you exactly what ad format you should use to fulfill your specific business needs. Thought that was all the advertising LinkedIn has to offer? Think again. Video is the new content! Users, all over the web, like to consume video content left, right and centre and the biggest social professional network is no exception. 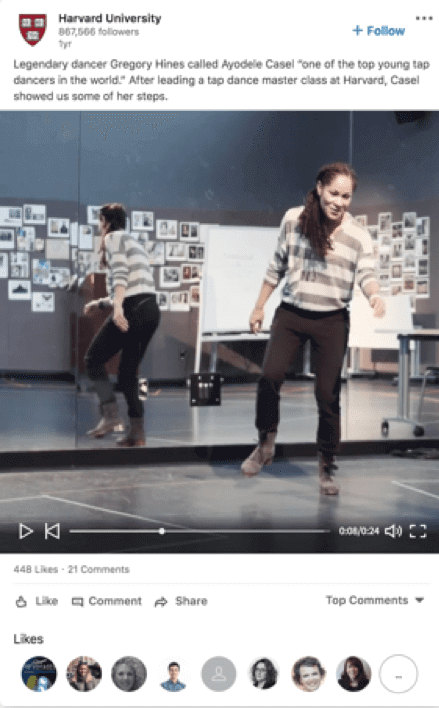 LinkedIn was quick to jump on the video bandwagon and currently allows users to post videos organically on their feeds and sponsor them if they wish to. But expect them to soon push video in other advertising options they have to offer as well. Video content on LinkedIn garners six times more engagement than normal posts and can really make you stand out if you make good use of it. I think going forward in 2019, publishing video content on LinkedIn can be the differentiating factor between B2B businesses that actively scale or slumber on the platform. Like I said before, all your publishing and advertising efforts will go to waste if you are aiming them for the wrong audience. This is where LinkedIn is so powerful with its extensive targeting and segmentation options. Since users present on the platform have to keep their profiles updated at all times for professional incentives, it allows LinkedIn to offer advertisers advanced targeting options that help them target the users they want on the basis of the company they work in, age, gender, location, skills, education etc. This targeting capability at the most granular level helps advertisers present on the platform target those users who are most likely to engage with their ad content and helps them boost conversions. These targeting options are available for all the ad formats available to advertisers on LinkedIn. 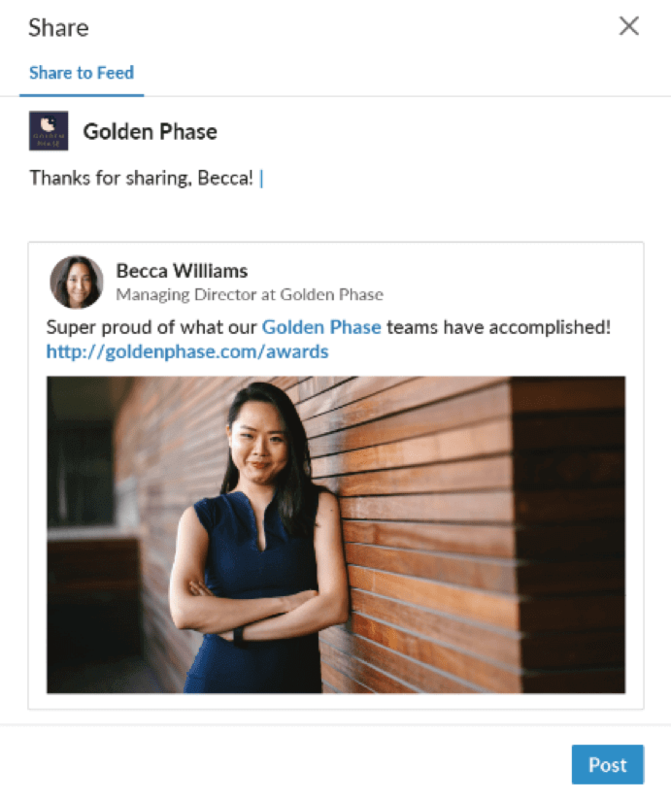 One of the latest features of LinkedIn Business Pages, businesses can now re-share content shared by their employees and any post that mentions them on LinkedIn. You are able to re-share great product reviews and customer testimonials about your business to present it in the best light possible to the world. It’s just like how you re-tweet tweets but for LinkedIn. Simple. One of the main pain-points of generating high-quality leads is the pesky process involved in soliciting all the relevant information from users. Most of them leave halfway seeing a big form waiting to be filled in to allow them to take up an offering (such as an ebook or webinar). LinkedIn makes this process easier with its advanced Lead-Gen forms, which seamlessly fill in all the required information about a user and helps them sign up for a service with just a couple of clicks. 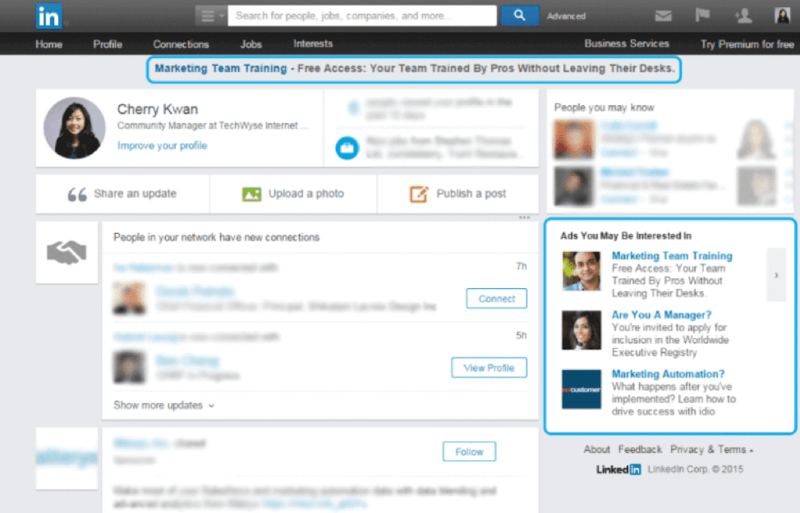 Currently, LinkedIn’s Lead-Gen forms are available only for Sponsored Content and Sponsored InMail. Moreover, Lead-Gen forms come studded with analytics. You can easily see how your lead forms are performing through the Campaign Manager and make the necessary adjustments to make sure your campaign is a success. Looking to get your sponsored content in front of a broader audience outside of LinkedIn? Then LinkedIn Audience Network is the perfect solution for you. 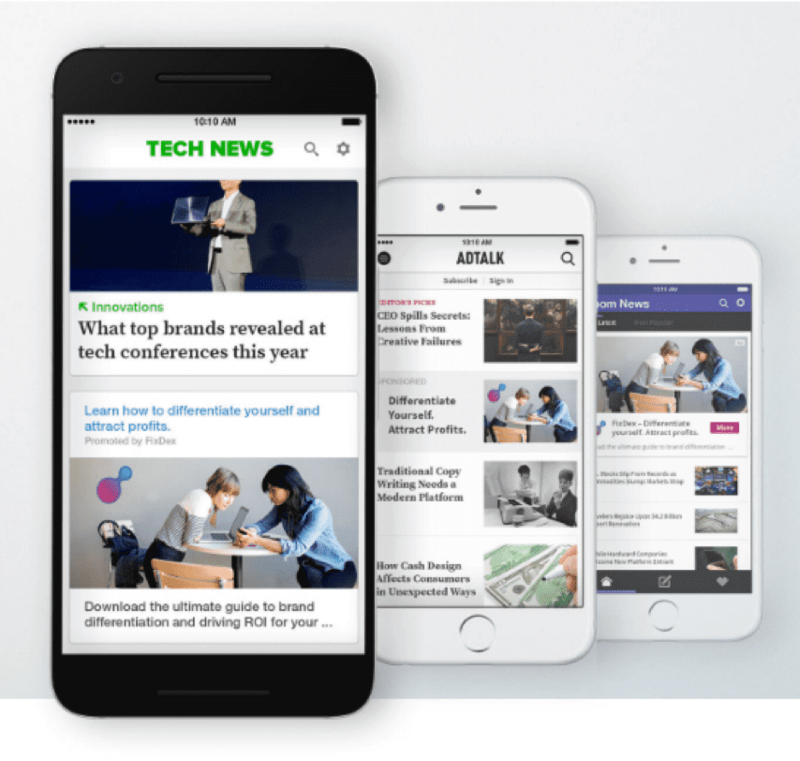 The LinkedIn Audience Network includes a myriad of high-authority publishers around the web where you can advertise your Sponsored Content, helping to increase your exposure and engagement. When you create a Sponsored Content campaign, the LinkedIn Audience Network is enabled by default in the Campaign Manager. You can choose the publishers where you want to display your content on or you can turn it off right off the bat, the choice is completely yours. Retargeting is a sure-fire way to convert users who are already interested in the products or services you provide. 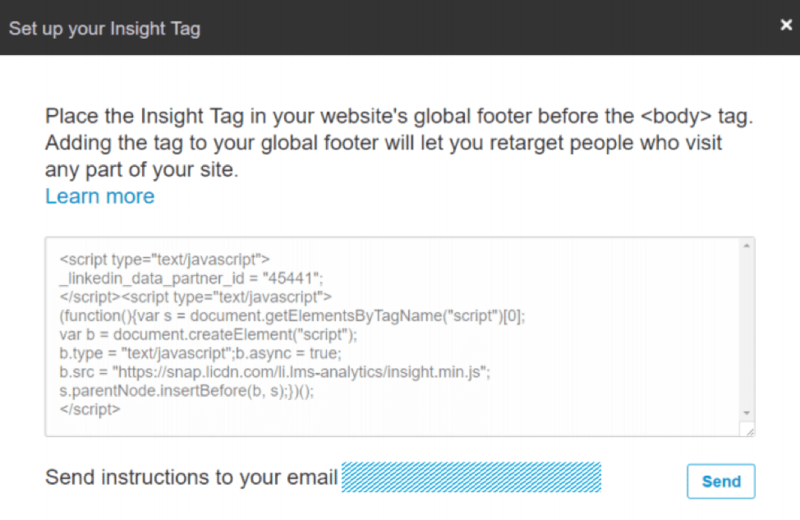 By placing an Insight Tag on your website, you can run retargeting campaigns from your LinkedIn Campaign Manager with ease and re-engage your website visitors. You’ll just have to define the URLs of your website from where you want the Insight Tag to fetch visitor data from and define that audience segment, the Insight Tag will do the rest. Once enough data is collected, you can easily create the kind of content that would resonate with their needs and run retargeting campaigns to make them convert. As you must have guessed by now, the LinkedIn Campaign Manager is the place where you’ll get in-depth information about how all your LinkedIn advertisements are performing on LinkedIn and around the web. 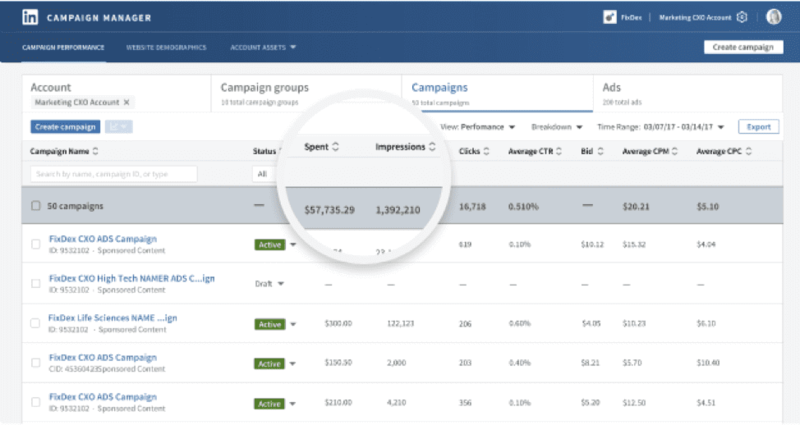 You can also learn a lot about who is engaging with your ads within the Campaign Manager itself to inform all your future ad campaigns. The Campaign Manager also lets you pause and A/B test underperforming campaigns without any additional hassle. For your LinkedIn page insights and measuring the performance of your organic posts on the platform, you’ll have LinkedIn Analytics by your side to help you every step of the way. LinkedIn Analytics is broken down into three categories: Visitors, Updates and Followers. The Visitors tab will tell you everything about how many users are visiting your business page on LinkedIn, who they are and where they came from. The Updates tab will enlighten you about how your individual posts are performing on LinkedIn, including impressions, clicks, likes, comments, shares and the overall engagements your posts receive. The Followers tab will tell you everything about the followers you’ve lost or gained in a specific time frame and who exactly are they, where they work and every other information they’ve given to LinkedIn. Forgetting the latest scoop of what’s happening at LinkedIn and staying on top of the latest trends, I would strongly suggest you follow the marketing team at LinkedIn. Their blog is an awesome resource for everything related to advertising and publishing on LinkedIn and who knows who might learn something new from there (which you definitely will). LinkedIn is much more than just a platform which job seekers and recruiters use to find their perfect match, it’s an advertising powerhouse that you can make use of to build awareness, showcase yourself as an authority in your business niche, build meaningful relationships with the most influential people around the web and generate a lot of leads for your business. Use the above-mentioned ways to make the platform work for you and do tell us in the comments how it went for you! Vibhu Satpaul is the co-founder and CxO at Saffron Edge. A graduate from London School of Economics in Information Systems & Softwares, Vibhu specializes in Marketing and Technology Solutions that helps improve efficiency and value creation for businesses.